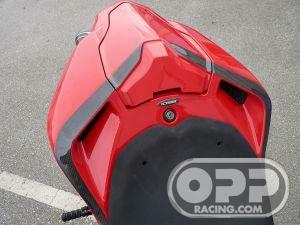 Clad with CDT bodywork, custom painted in Ducati red to give it a very subtle yet stunning look. The paintwork left some carbon visable for those who pick up on the details. To go along with the bodywork is BST carbon fiber wheels, Brembo brakes, BST carbon fiber swing arm, EVR airbox, TWM carbon gas cap and a host of other beautiful parts.